As we begin a new year, it’s a great time to consider those home improvement projects you’ve been putting off. Upgrades to your home’s aesthetic appeal and functionality will not only increase its overall value, but it also provides a additional ease and comfort to your everyday life. For the busy homeowner, knowing where to start with your home remodeling project can be challenging. A great way to come up with ideas and inspiration is to understand the latest trends, particularly those which are likely to stick around after 2018 and beyond. The last thing any homeowner wants is to invest in custom redesign or remodeling project, only to have it go out of style shortly after. In this in-depth guide, we’ll share with you the latest home remodeling trends that we believe will stand the test of time. 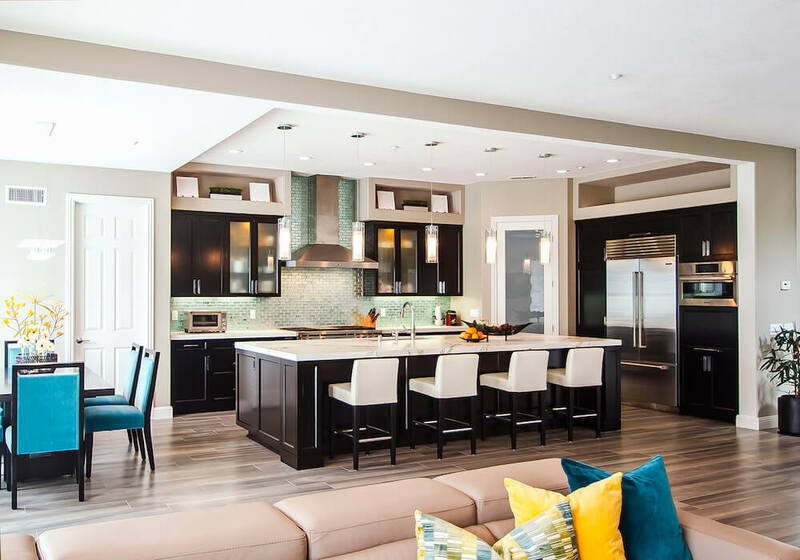 We hope you draw inspiration from some of these home design and remodeling ideas, and gain actionable insights about some of the hottest trends in the industry. At Murray Lampert Design, Build, Remodel, we do our best to offer valuable information to our community through useful articles, guides, tutorials, and expert insights. If you find this guide useful, please share it with your family and friends, or let us know what you think on Facebook, Twitter, or Houzz. If you’d like to download the full PDF version of this guide, you can do so here by clicking here. 2018 will see some popular design ideas expanded upon to create entire kitchen themes. Best of all, many of these kitchen remodel trends can be adjusted to fit any budget and completed in a fairly fast timeframe. Without further ado, here are the top 6 San Diego kitchen remodeling trends we see on the horizon for 2018. Technology is making its way into home remodeling trends and it’s not slowing down any time soon. In 2018, you’ll see major kitchen upgrades made to add ease of use to the home. Many new homes are being built with smart technology from the ground up. But for older homes, there are several ways to integrate smart home technology into the kitchen through use of gadgets and sensors. Expect to see smart lighting and appliance upgrades in 2018. From automatic coffee makers, phone-controlled lighting, to smart refrigerators that can tell you when groceries are running low, the options are endless. If you’re thinking smart kitchens are for the young and tech savvy, think again. Homeowners of all ages are taking advantage of the benefits that technology can bring to the home. San Diego has seen the core idea of hidden functionality take hold over entire home remodels. 2018 will see this idea sweep even more quickly into kitchen remodels. The entire concept is centered on keeping everyday kitchen gadgets and utensils hidden away from view. The idea is to make use of every ‘negative space’ that a kitchen has to offer. If this doesn’t mirror the minimalist trend, we don’t know what does! Remodeling ideas for a kitchen that are based on this concept are expansive. Lower cabinets are being designed to house pull-out trash cans, as well as nooks to hide countertop gadgets such as coffeemakers, blenders, and toaster ovens. Pantries are being overhauled to make greater use of shelving in the same amount of space. Counters are being cleared with this concept, allowing more room for cooking as well as a greater visual appeal to the finer details of a freshly remodeled kitchen. One of the most noticeable trends that is sweeping San Diego in kitchen remodeling is pendant lighting. Upon entering a kitchen, a well-displayed and functional pendant lighting setup is often one of the first things that will be noticed. This is directly a result of a desire for the contemporary look in San Diego. There are thousands of styles and designs to pick from, making it a hot trend in customization. Pendant lights will be featured heavily over islands and bar areas. There are several ways that people decide to hang the lights, whether it be varying heights or custom integration to allow visual layering to the foreground. Working with an interior designer to choose pendant lighting is key. You’ll want to choose fixtures that will outlast the latest fads. This kitchen remodel idea is picking up more steam with each passing day, and is relatively inexpensive. This trend saw a distinct rise in 2017, and is showing even more growth heading into 2018. The San Diego area prides itself on current themes and styles. That being said, open shelving is likely here to stay. The overall thought behind this remodel idea is quite simple. Of all of the trends on this list, creating open shelving is by far the cheapest option for a remodel. There are several challenges to pulling this off, however, as great care must be taken to ensure that the organization of kitchen clutter is on point. When done correctly, open shelving creates a larger atmosphere for smaller kitchens. This can make your San Diego kitchen lively and aesthetically pleasing. The industrial look is a powerful remodel trend that is likely to be a top choice for many homeowners. The polished design of this kitchen remodel trend is one of the most popular choices for open floor plans. Some of the details in this remodel concept revolve around exposed brick, dark-colored cabinets and trim, and concrete countertops. This remodel can bring a breath of fresh air into a dated kitchen. 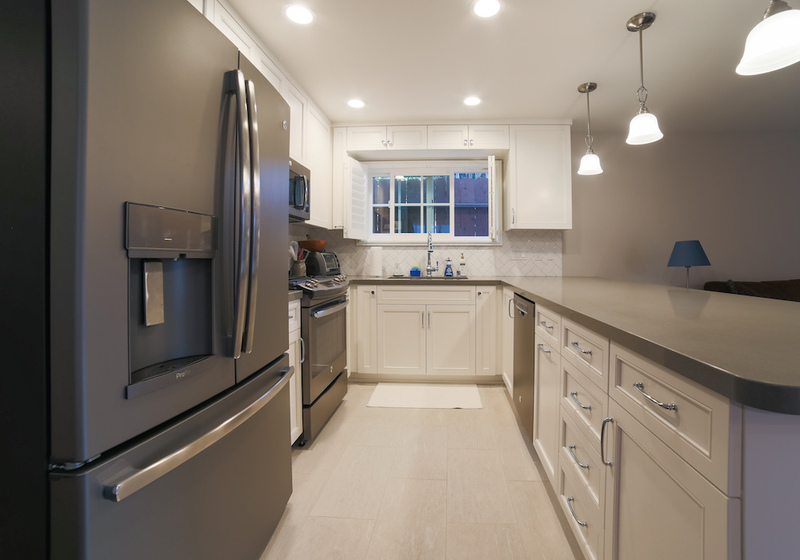 Stainless steel appliances are often the desired choice to complete this modern overhaul. The industrial look is hard to beat in the San Diego area. 2018 Kitchen remodeling trends will not forget your furry friends. We’re seeing an increase in demand for additions to accommodate pets. From feeding stations to pet food storage, and even dog and cat beds installed underneath kitchen islands, many homeowners have realized that they need customized space to keep their pets happy - even in the kitchen. Bathrooms are often overlooked when it comes to home remodeling. They are often the smallest areas in the house, but perhaps the most visited by guests and occupants alike. While the overall aesthetic and layout of the bathroom can be adjusted, it is often difficult to add additional space. 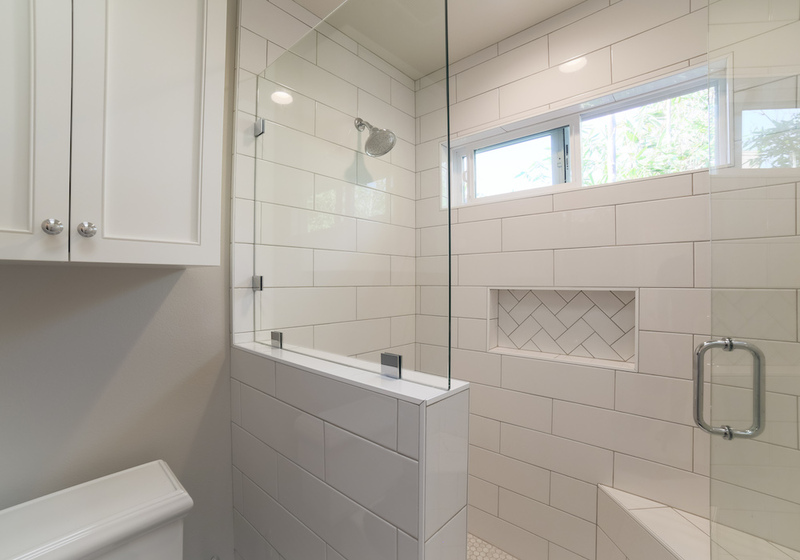 Strategic bathroom remodels typically focus around improving overall foot space, as well as coordinating an overall look that will match the rest of the home. From color schemes to styles of toilets and tubs, there is plenty of room for creativity in a bathroom remodel. The remodeling process has begun to encompass full floor plans, so bathrooms are high on the priority list. 2018 is said to be the year of bathroom remodels, and homeowners are craving peaceful, tranquil spaces that stand out from the typical wash rooms you see. Minimalism is a huge trend and it’s not going away any time soon. The simple and basic principle is a hot design idea, especially on the West Coast. The idea is that it keeps the aesthetic conflict to a minimum. The eyes stay relaxed, and the overall cleanliness of the minimalist bathroom design is emphasized. Grout lines in the tile are kept to a minimum. Base colors are used, and lighting is bright and focalized on the center of the room. 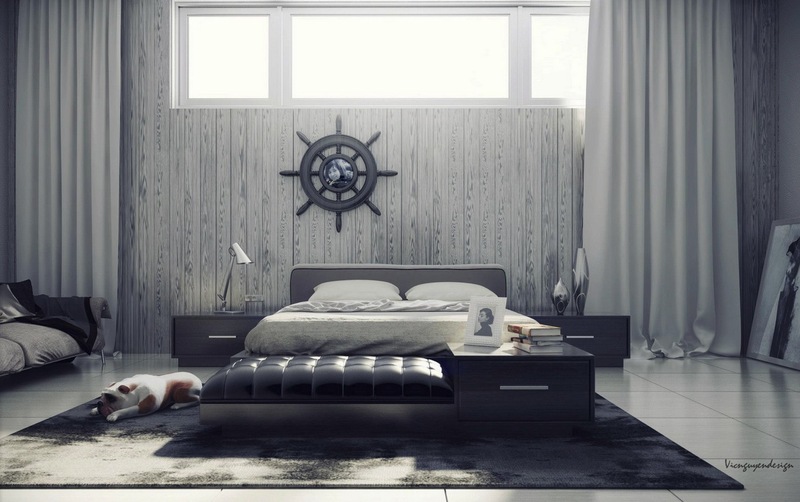 This concept is all about keeping it clean and classy. The old fashion rule, “take off one accessory before leaving the house,” applies to minimalist home design as well. It can be easy to clutter a small room with too many focal points, but with minimalist bathrooms, less is more. Focus on one major piece: an interesting mirror or modern vase, but keep the remaining elements muted. You can extend the minimalist theme by choosing modern finishes and appliances simple-design toilets, sinks, tubs, and fixtures. Wood is a major trend in home remodel overall. A close cousin to the minimalist theme, natural elements like wood add simplicity, and you guessed it…nature! The sleek and stylish look that wood offers is apparent as soon as you walk into a home. Wood elements provide grounding and calming vibes, and homeowners are going crazy for it. Consider water-safe wood flooring in the bathroom or wood finishes on bathroom cabinetry. You can also add subtle wood elements such as borders around mirrors or wooden vases with faux greenery. Wood platforms used as shelving is a clever way to incorporate wood into your bathroom remodel plan. Showers can be floored with wood to add a comfort to your bathing experience. This trend is growing and we expect to see it sticking around for years to come. Nature never goes out of style. Industrial design, in general, has been one of the hottest trends in home remodeling in recent years. The bathroom is no different. This design aims to create the look of an imperfect environment. Within this imperfect look, it is a completely elegant and structured design. Industrial design adds a sense of masculinity to a room, which can be unexpected in a bathroom space. Bricks and exposed pipes are usually heavily emphasized in an industrial look. You can opt for waxed concrete flooring to provide that key unfinished aspect that gives industrial design its homage. Add a few decorations using rustic wood, and your bathroom is sure to be a modern, industrial masterpiece. Technology continues to improve and impact our lives in many ways. In 2018, technology is joining you in the bathroom! From sensors that know your preferred water temperature, to towel warmers, wireless music players for the shower and automatic sinks - 2018 is sure to offer you the most comfortable and luxurious bathroom experience possible. Believe it or not, even the toilet is under the spotlight in 2018 bathroom remodeling trends. With added features to provide additional comfort to your everyday life, toilet manufacturers are stepping up their game in a major way. When it comes to smart toilets, think: automatic lids, LED lights for nighttime use, seat warmers, and eco-friendly flushing. Many of us never thought we would see the day that the chrome colored fixture was slowly working out of popularity. But step aside chrome, there’s a new player in town. 2018 will bring the return of brass! We’re sure you’ve seen brass notes used in wedding decor, but it’s really gaining popularity in the home. Brass has many advantages for a bathroom remodel, most notably for how well it works within a rustic wood or industrial design. Brass is easy to clean, and can be polished in several different ways to achieve the exact patina you want. We love incorporating brass fixtures to complement warm or gray themed bathrooms, but there are endless options for pairing brass. The overall desire of brass and gold toned fixtures is to provide a traditional element to a modernly upgraded bathroom. They enable a bathroom to have that unique and classy feel that is sought after in a San Diego home. Overall, bathroom remodels are fairly straightforward. They key is to choose (and stick to) your theme, while also considering the functionality and lifestyle needs you have. The challenge is to pick a theme that not only matches the rest of the house, but will complement the desired tones within a color scheme. This is something our home design team excels in. The best thing about the trends in 2018 for bathroom remodels is that they complement each other so well. They can be used together with proper planning, and most of them can go with any central color scheme. Creativity is king in a bathroom remodel, and these trends allow you to do just that! Most homeowners know that additions to a home can increase the value of the property, as well as the overall appearance of their home. But there are some specific home addition trends that are emerging in 2018. 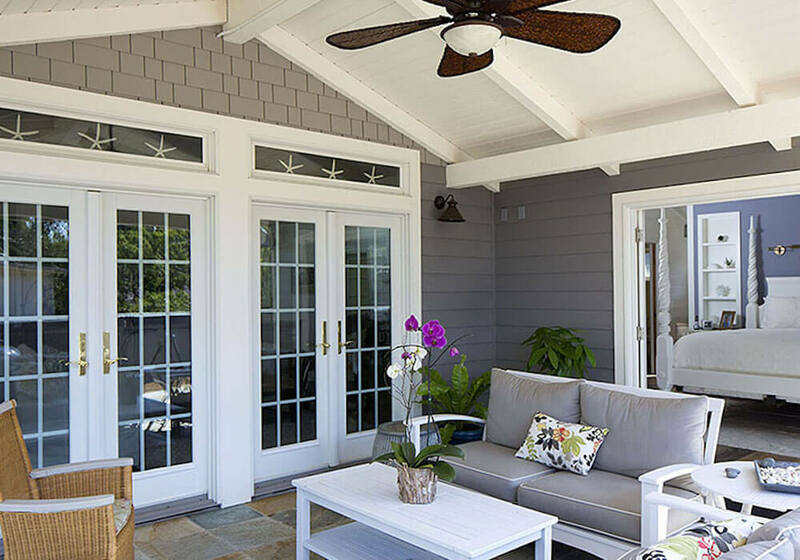 From small upgrades and add-ons, to major room additions and installations - there are a ton of home additions that homeowners in San Diego are considering this year. Many of the trending home additions in the San Diego area are centered on adapting to new technologies and increasing usable square footage. While some of these additions may get somewhat pricey, they are an investment in the equity of your home and have major payoff. Even still, there are several ways to add to your home while maintaining a realistic budget. Many homes in San Diego were built decades ago, before the idea of open concept kitchens became popular. Not to mention, older homes in this region are typically smaller, and a smaller home usually means a small kitchen as well. The kitchen is undoubtedly the most important room in a home. Not only can it be the major focal point, but they are the central hub for growing families. In 2018, you’ll see homeowners ditching their small, closed off kitchens for wider, open concept remodels that provide more space. Depending on the layout of your home, your contractor can help advise you of all the possibilities for extending your home efficiently. Let’s face it, in many areas of San Diego county, lot sizes can be small. When you can’t build out, the only way to go is, you guessed it, UP! This is why second story additions are growing in popularity. As homeowners crave more square footage, or take in aging parents, building a second story can be the best option. When considering a second story addition, it’s important to find a design-build firm that is an expert in the process. This kind of home remodel requires structural engineering knowledge, permitting, and excellent project management. The need for better accessibility in San Diego homes is a result of older generations moving in with loved ones, as well as expanding on the ever popular open-floor plan. Common accommodations typically involve widening doorways, leveling showers and removing tub walls, decreasing steepness of steps, and adding custom yet stylish handrails where needed. Aging in place accommodations can even mean complete in-law suite renovations. This will add value to a home as well as open up many spaces that are typically closed off from the rest of the room. Master Suites are considered a major renovation and can be an expensive remodeling project to undergo. The huge upside for the family on the fence about making this happen is that it can instantly set a house apart from other homes in the San Diego area. The investment in a master suite is an easy one to make, and likely a highly profitable one. The master suite concepts for 2018 revolve around open space and luxurious additions. Many suites are adopting perks that include fireplaces, televisions built in to both the bedroom and bathroom walls, reading nooks, and skylights to enhance natural lighting. Rock work within the entire room to accent a modern design truly drives home the entire benefit of a master suite. The design concept of the master suite is an open area that includes a large bathroom connected to the room. This allows for the open concept to hold true in every area of the house. All of these home addition trends for 2018 have one thing in common; they ensure that the time spent at home is both relaxing and accessible. San Diego homes are leading the charge in most of these categories. While home additions can be costly and time consuming, the final result will yield much enjoyment, and a good profit if and when the time comes to sell the home. If a patient approach is taken in the planning and execution of a home addition, the process can be smooth and painless. 2018 will be a big year for home additions in San Diego! Interior design trends can be a bit finicky. It seems as though with each passing year, the trends completely change. This is different from most any other element of home design, as other trends normally last between 3-5 years. 2017 saw the popular trend of natural light with bright-white coloring take hold. We expect 2018 to feature many contrasting elements to this recent trend. It’s important to understand how changing trends will impact the future look of your home. Interior design changes should never be wholesale adjustments. In order to effectively stay within the trends, you must be able to adjust an interior design without having to break the bank each time. Some interior design changes will likely make it for the long-haul, however. 2018 will most certainly bring about much change to the interior of San Diego homes. Natural wood elements liven up a room with minimal effort. The calming and grounding tones of wood offer a peaceful yet structured feel. Wood, in general, is something that has seen a growing popularity in many aspects of home design. Ideally, natural wood should be used to accent the main features in a room. Let’s not go overboard! Natural wooden mantles can provide a delicate touch to any living room setup. Wood furniture provides a pleasant tone, and can match most any color scheme you choose. Two story homes can add a gorgeous natural handrail for the stairs, or you can even opt for a wooden staircase entirely. There are many opportunities to incorporate natural wood within your San Diego home. Combining the pleasantries of a kitchen with the entertainment value of the outside living area is reason enough to add this to your San Diego home. With a growing emphasis on outdoor living spaces, it’s no wonder that a kitchen window pass-through is featured trend in 2018. These space-creating windows can be added at a relatively low expense, and will increase the overall value of your home, as well as add a unique design feature to both your kitchen and outdoor space. Interior metallic finishes directly correspond with the growing desire for a clean, industrial look. Metallics have a unique quality that is truly one-of-a-kind, conveying both style and strength. The reflection of natural light from metallic finishes can brighten up a room without the need for additional light sources. The design possibilities behind this trend are enormous. Metallics can be used to outline most aspects of your home. They work great around fireplaces, bathroom elements, and even furniture arms and legs. Metallic finishes go great with nearly every color, but can look especially good when paired with warm colors. This overall design will provide a modern, sophisticated look to any area of your San Diego home. It has been a while since dark colors were in style. Recent years have focused on white, cozy colors and neutral tones. 2018 will finally see the revival of darker, more moody tones. Violets, dark blues, dark grays, and burgundies are all heavily trending as we head into 2018. The big theme behind this is contradicting tones between the interior wall colors and the furniture and accents within a room. Dark walls should make for light colored furniture selection. Lighter colored walls will pave the way for dark, aggressively toned furniture. This allows an aesthetic quarrel to happen that ends up being very pleasing to the eye. Perhaps the most unique trend in the San Diego area is the return of the floral pattern. A floral theme should never overtake a home, but with precise placement, this trend can really accent a room perfectly. Florals work best with light background colors. There are many styles to choose from, with some much more aggressive than others. Floral furniture patterns are the most popular aspect of this trend. This furniture pattern is perfect for a home office or a sun room. Incorporate floral furniture one piece at a time. Start with an accent chair before moving on to anything more drastic. You can also incorporate the floral theme with artwork and real or faux floral arrangements throughout the home. We love florals for the same reason we love wood elements - bringing nature into the home provides a cozy and cheerful atmosphere. The overall trend for interior design in 2018 is one that screams authenticity. This is further emphasized by looking at many of the other remodeling trends in the San Diego area. Natural wood and stone are taking a hold of the market. Classic furniture is finding its ways back into homes. The days of faux materials are over, at least for this year. Authentic, natural materials will ensure that your interior design vision is current and trending. San Diego homeowners will experience much change from year to year when it comes to interior design trends. The good news is that most of these trends can be implemented on a limited budget with a bit of creativity. Always pay attention to your color scheme, and be sure that you’re attacking the overall theme of your space. At the end of the day, it’s all about visual appeal and the comforts of an individual room. A great outdoor living space can make your San Diego home a step above the rest. In a climate that is sunny and mild for the majority of the year, it’s a no brainer to renovate an outdoor living space to mirror the luxury and aesthetic of home’s interior. There are certainly a ton of tried-and-true design ideas for an outdoor space that have stood the test of time. Many of these ideas, such as decks, patios, and fire-pits will continue to grow in 2018. The similarity between the traditional outdoor living space ideas and the trends of 2018 is how they are creatively being used to better take advantage of technology and smaller landscapes. Here’s our take on some of the hottest outdoor living space trends for 2018. The fire-pit trend has been in full swing for many years. Until recently, most outdoor fireplaces were reserved for high-dollar properties and modern homes. 2018 will see the continued popularity of outdoor fireplaces evolve to include most any style of home when done correctly. Patios are a great place to incorporate an outdoor fireplace. An exterior wall creates the perfect location to install the fireplace with a fully furnished mantle resting above. This creates a great living space to enjoy the mild San Diego weather in a relaxed, outdoor environment. 2018 will certainly see a continued trend in incorporating technology into every area of the house. Adding televisions to most any covered outdoor living area is a great way to increase the capabilities of entertainment for a space. Whether they are mounted into an exterior wall, or cleverly displayed from the ceiling, the entertainment value for an outdoor living space is drastically increased with the addition of a television. The world of Bluetooth integration has been taking over outdoor living areas for the past few years. 2018 will see this trend continue. While relaxing in your outdoor area, you can control every entertainment aspect with the convenience of your cellphone. Stereos, televisions, and even fans and lighting can be controlled with a quick swipe of a finger. The classic concrete, brick, and mortar look is quickly fading out. The days of the wrought iron and faux plastic fencing are gone. 2018 is shaping up to be the year of refurbished wood and natural stone in outdoor space design. The best thing about this trend is that it is quite affordable on any budget, making it a practical solution when remodeling your outdoor space. Fencing and handrails will be highly revolved around refurbishing old materials to create a classic, rustic look. Concrete slabs are becoming the norm with each passing year. Natural stone, however, will be a trend in 2018 that shakes things up and creates unique designs for walkways, foundations, and fire-pits. There are several ways to polish off the finished product to get the exact look that is desired. Homeowners in San Diego have caught on to the numerous environmental benefits of xeriscape landscaping, and we will see drought-tolerant landscapes pop up in more and more yards this year. Not only is the cost of watering grass and other thirsty plant-life unbearable, it’s near impossible to keep these plants alive during the hot summer and fall months. Homeowners are getting educated on the benefits of using plant-life that thrives in our coastal desert climate and are following suit. Combine that with the rise in popularity with succulents and cacti, and you’ve got yourself a trend that will be standing the test of time. Once upon a time, alfresco kitchens were coveted by nearly every homeowner. They fell out of fashion in recent years, however, as homeowners struggled to justify the additional space, cost, and maintenance of an outdoor kitchen. With the growing trend of stay-at-home entertainment, we think 2018 will see many San Diego homes incorporating an Alfresco kitchen to bring the party outside. Outdoor dining is growing tremendously in popularity. This outdoor trend goes well beyond a simple grill. Kitchens can be fully functional, complete with ovens, beer taps, sinks, and refrigerators. The general focal point of this trend is to allow families to have a fully functional outdoor living area that will suit any need they possibly could have. Water features have been a mainstay trend for many years. 2018 will see a growth in the diversity and creativity in how water features are incorporated and used. Many water features can even be controlled through an app. Fountains, koi ponds, water falls, and bubbling rocks will continue to be the top water feature choices for 2018. San Diego, in particular, has a great climate that allows these features to stay looking their best. 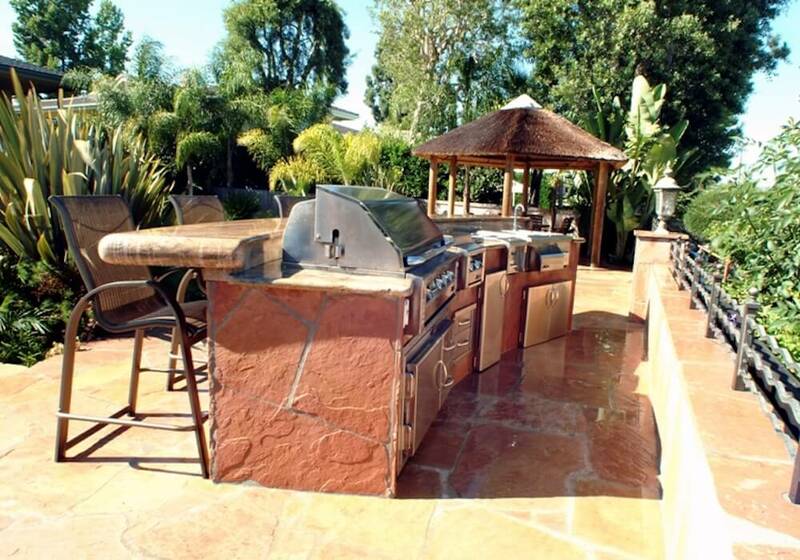 Natural stone materials can be used to greatly increase the aesthetic appeal of these features. There is a ton of room for creativity with this trend. Outdoor living areas not only create a environment for entertaining and family memories, but they expand your living space and add value to your home. There is nothing worse than a beautiful San Diego home with a boring, unused outdoor area. The trends of 2018 point to full inclusion of technology, as well as customization of classic ideas. An outdoor living space can sell a home by itself if done correctly. San Diego features a gorgeous climate, and the homes in the area should have outdoor living spaces that take advantage of this.